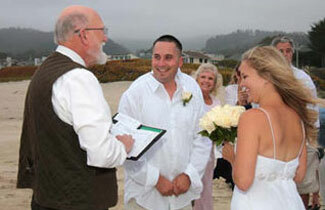 Roosevelt State Beach is on the San Mateo County Coastside, south of San Francisco; it’s one choice for our Destination Wedding Package or Terry can just be your officiant. Directions: From Highway 92 turn right onto Highway 1, then turn west on Young Ave. 1.4 miles north of Half Moon Bay. At the guard hut turn right to get to the south end of the parking lot. For Information on Half Moon Bay State Beach call 650-726-8819.